One of the more memorable action sequences in Aquaman involved Arthur Curry and Mera finding themselves assaulted by monstrous creatures of the deep that bring the entire boat down. They are the Trench, and surprisingly, they’re about to get their own horror spin-off. The Hollywood Reporter has revealed that DC’s monsters are set to be the antagonists of a horror film expanding upon the world of Aquaman, the first billion-dollar movie of the DC Films setting. The film will not involve the cast of Aquaman and will instead explore a certain aspect of the world that was merely glimpsed at in the film. A sequel to Aquaman is still planned, but director James Wan and company are taking their time on the project. Warner Bros. have enlisted first-time screenwriters Noah Gardner and Aidan Fitzgerald (who are both former Bad Robot assistants) to develop this project, which is planned to be a modestly-budgeted exploration of the ravenous sea creatures. The film will feature the Kingdom of the Trench, which was previously glimpsed at in Aquaman in the scene where Arthur and Mera had to navigate its waters to find the Trident of Atlantis. 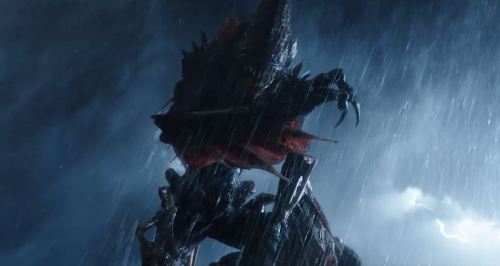 Details on the plot are light, but if I had to guess, then the story would likely revolve around ordinary seafarers being stranded in unfriendly waters while having to fend off several of these monsters. Suffice to say, this is about the last DC project that anyone expected, but I don’t think it’s inherently a bad idea. Whether or not these monsters can carry an entire script is a question that should be deeply considered before Warner Bros. commits to making the film, but it seems like a decent idea to expand upon something that worked in Aquaman itself. This project obviously isn’t going to take the place of, say, Wonder Woman 1984 or The Batman in terms of priority, and will likely be a low-budget effort that can ride some waves off of Aquaman‘s success as the DC Universe continues to establish a new approach that will set them apart from competitor Marvel Studios. The Trench is in development at DC Films.